I have often told people who want to write mysteries that one of the most fun parts is research. You get to talk to interesting people doing important work – and they’re often as flattered at your interest as you are interested in their answers to your questions. But the research for A Murderous Yarn has redounded to my pleasure several times over. First, I got to meet people who restore and drive cars that are approaching (or have passed!) their first century on the road. Then I got to ride in the cars: Sears, REO, Brush, Cadillac, Model T Ford, Buick, Stanley Steamer. 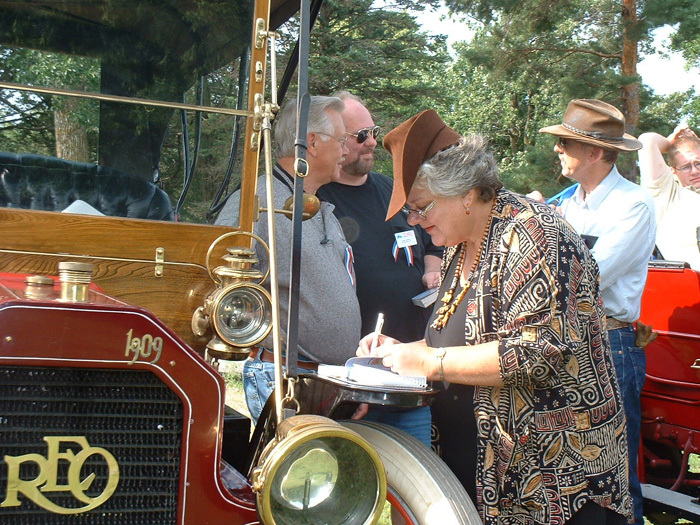 And then, after the book came out, I was invited back to the annual New London to New Brighton Antique Car Run to do a special signing (and ride some more). Golly, I love my job. It was, as always, a terrific time! 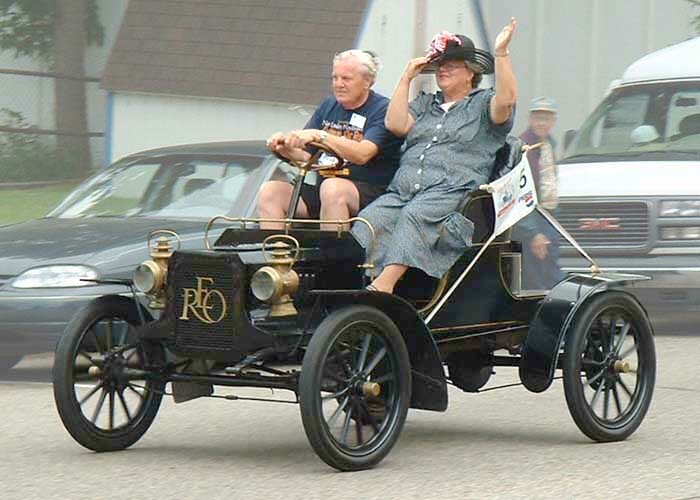 This year they specially invited steam-powered cars, and there were nine or ten signed up — but four were all from one family group and on the very last leg of their trip to New London they got word that a family member had died, and they all turned right around for home. 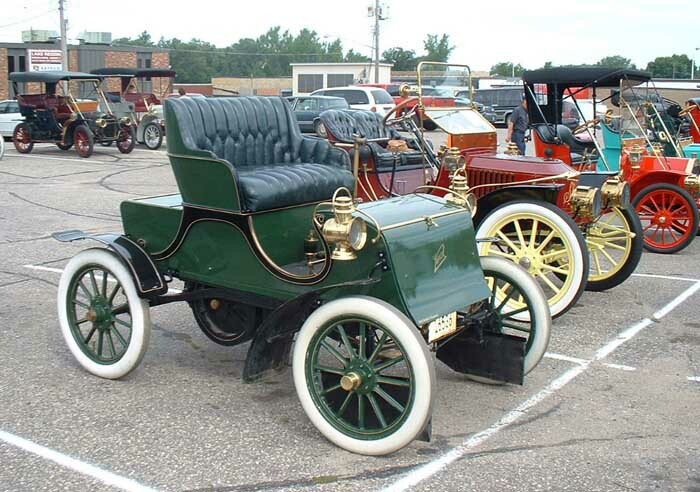 The ones that did come were all Stanleys, including Gene Grengs’ wonderful 1910 and a 1923 model with a condenser — it looked like an internal-combustion car’s radiator. Could that car dash along! Wow! I was going out Highway 23 to our motel late one afternoon and met that ’23 coming in, flying low. It was going at least the speed limit of 55 mph, running totally silent, an enormous bright-red ghost. Three modern cars were following close behind, obviously determined to follow it to ground, so they could ask questions. On Thursday I got to ride in a Stanley from around 1910 or 11, that had some problems. 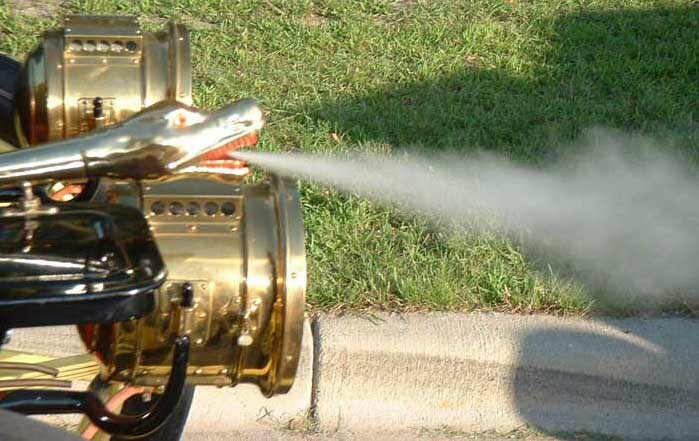 The water pump worked continuously and noisily, with a sound like fast rapping with a small hammer on a block of wood. There was a leak (or perhaps several leaks) so it had trouble maintaining fuel pressure and so would moan softly to itself when stopped, trying to rebuild a head of steam. And there was a strong odor of kerosene that seemed to gather in the back seat, where I was sitting, making me dizzy. Nevertheless, it was an exciting experience, riding in the smooth-running machine — antique cars of the internal combustion persuasion jiggle. Steam cars don’t. On Friday there was a parade and I was invited to ride in a 1908 REO, a little two seater with two forward gears, Low and High. In low there was more power, which we needed to get up a substantial hill at one end of New London to gather before the parade. Chug … chug … chug, went the little car that could, but we made it. There was a nursing home there, and everyone came out to look at the cars. Coming back down the hill and through the main street of town was a whole ‘nother story. I had to hang onto my hat! People cheered and laughed and it was great! Then came the steak fry. I was amazed at the young men from the American Legion Club. They set up a collection of big grills and produced an enormous quantity of fabulously delicious steaks. None burned, none raw, none tough, amazing. And the cole slaw was the really good kind everyone remembers from his or her childhood. A big baked potato completed the meal. Saturday morning I went to the Flying Goose Quilt Shop in town and signed lots of books. The antique cars had begun their big run earlier, so the people who came in were all stitchers. The proprietor had done an excellent job of advertising the event, and had sweet rolls and coffee all lined up. I was supposed to be there just an hour, but of course ended up staying longer, so I was a little late getting on the road to Buffalo, where the antique cars were going to stop for lunch on their way to New Brighton. Unfortunately, I got behind a row of three trucks pulling long trailers, and there was a lot of oncoming traffic, so I couldn’t get past them. And they were moving slowly. So while I was supposed to be in Buffalo at 11:30, I didn’t get there until a few minutes past 12. But I quickly sat at a table in the high school cafeteria and prepared to sell and sign books. Kept so busy I barely had time to eat lunch myself. And I didn’t get a chance to go out and talk to the drivers or look over the cars. Then it was off to New Brighton. I arrived ahead of the cars this time, and the Mayor shook my hand and introduced me to the crowd — New Brighton was having a fair in the same park where the cars gather. 52 cars set off on the run, and 48 finished, a very respectable percentage. One elderly gentleman had not been able to compete for a few years, but now he was back; and to celebrate, he brought along his bagpipes and on crossing the finish line, he played a rousing Scottish tune — Scotland the Brave, I think it was. Later, during the awarding of the medallions for the finishers, he stood and played Amazing Grace. Very touching. One young man came in barely in time to collect his medallion. His shirt was filthy and oil-stained. I said, “Did you have to ‘get out and get under’?” He grinned and replied, “Many, many times.” But he finished, and good for him!